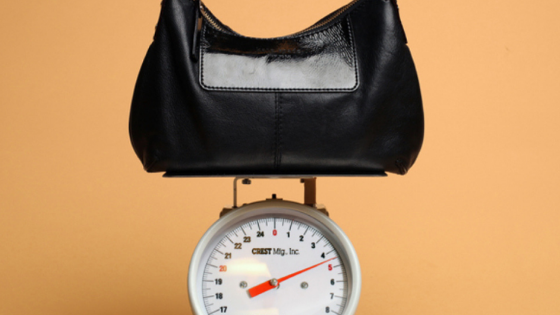 Living Health Group > Blog > Be Informed > Are your heavy handbags weighing you down? Ladies – are you getting around with a heavy one-shoulder handbag? If that’s a yes, then this one is for you. Many of us towards the end of the day are noticing shoulder, neck and upper back pain as well as aching muscles. This can all be due to the type of bags that we’re carting around. Heavy handbags worn on your shoulder can lead to us rolling our shoulders forward, placing an uneven amount of pressure on the surrounding muscles – these muscles work hard to try to counterbalance the weight difference from side to side, leading to sore, tight and even weak muscles. Some of these muscles attach to the base of the skull and can be the cause of some of our headaches. So what can we do? Have a read of the following tips and make those shoulders happy again. The general rule of thumb is that your bag should not weigh more than 10% of your total body weight. Leave your change of clothes, shoes and things you don’t immediately need in the car if possible. If you are the overly prepared type who packs for every situation switch to a backpack. This will help evenly distribute the weight across the shoulders and back. Pay a visit to your health professional for advice on strengthening exercises for the neck, shoulder and upper back.